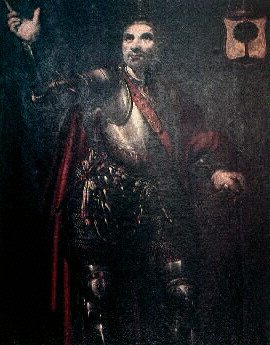 Sancho Ramírez, King of Aragon and Navarre. King of Aragon from the year 1063 until 1094, son and successor of Ramiro I, also King of Navarre from the year 1076, when the Navarre offered him the Crown of his Kingdom on the death of Sancho the Despenado. Declared vassal of the Pope so that the forces of the Holy See will help you defend your Kingdom from the conquering ambitions of neighboring kingdoms. In return, he/she was to attend the crusade waged from Rome in 1064 by Alejandro II. Sancho Garcés IV was assassinated in 1076; the navarros preferred to appoint a new King before creating a vacuum of power with the heir, of very young son. Elected to Sancho Ramírez, entitled as Sancho V of Aragon, and the Leonese King Alfonso VI, was soon entering Navarra and take several seats lost years ago. Both kings agreed that Sancho would be King of Navarre and vassalage would yield to Castile; In addition, they established new borders, where Castilla reached Guipúzcoa. During his reign, Aragon increased its territory with the addition of monsoon, Albalate de Cinca, Zaidin, Almenar, Graus, etc. He/She fought against the Arabs; in 1094 he/she besieged the city of Huesca, which was held by the King of Zaragoza, Mostain II, but he/she was wounded by an arrow. Before his death took an oath to their children, Pedro Alfonso, who would not forsake the site until surrender square, which got Pedro I.